You are here: Home › News › News › SRLP News › SRLP Celebrates New Home With ALP/FIERCE/QEJ! 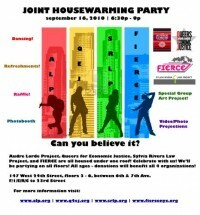 On Thursday, September 16, 2010, SRLP along with the Audre Lorde Project,FIERCE, & Queers for Economic Justice held a joint housewarming party to celebrate our new shared home at 147 West 24th Street (NYC). Free and open to all ages, over 500 people joined in this vibrant celebration of the collaborative spirit of four established community organizations with a combined 42 years of critical work in New York City. The (free) event raised over $3,000 from hundreds of small donations and 100% of the event’s proceeds will be split between SRLP, QEJ, FIERCE and ALP. Community members enjoyed a dance floor, group art project (“the LOVE wall”), refreshments, a raffle, speeches livecast on multiple floors, photo and video histories of all the organizations, and a contest to name the building. PICTURES UP ON FLICKR! taken by FIERCE media crew — more to come! and here’s a few pictures by Kian Goh of ALP!